The Carefree Way: The "big one." When NASCAR races at Talledega, they always talk about when "the big one" is going to happen. "The big one" is the inevitable large crash that takes out much of the field thanks to the tight racing caused by the restrictor plate. Well, I didn't involve anyone else, but today I had my "big one." We were in our qualifying session for the first of the two races at the SCCA Double National at VIR. I was drafting with Glenn Stephens (of Traqmate fame and a heck of a nice guy...thanks for the data help this weekend!) trying to get a good time in when I overcooked the entry to Oak Tree just a little and ended up looping it part of the way around. Glenn and I hadn't gotten a clean lap up to that point, but were still motoring pretty good. But Glenn got away, and I checked the track for traffic and took off. Never even killed the car, and I really only did half a spin to a stop with the rear wheels off the pavement. I made one mistake, and that was not checking my brakes. Something about that off caused my front left brake line to get cut. I went full bore up the back straight and was passed near the end of it by another Spec Miata. But I still hit fifth gear and was right on his tail going into roller coaster. He hit the brakes and I did as well, only my pedal went to the floor. I dove to the inside of him so as not to hit him (that would have been ugly for both of us!). As I was navigating his car and trying to make sure he didn't turn into me (nobody in their right mind would try a pass like that, so I knew there was a good chance he wouldn't see me or at least wouldn't be expecting me to be doing that), I kept pumping the brake pedal. I'm pretty sure I got five and likely six pumps before I left the pavement, but none did anything. As I cleared his car I tried to turn the car back to the right. As I did I knew it wasn't going to stay on the pavement, but I got it turned just enough to go sideways in the dirt, which helped scrub a LITTLE speed off. 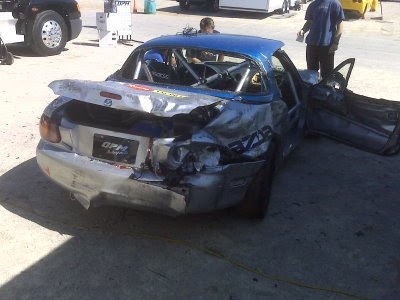 I hit a peak of 115MPH and the data showed I was only down to 100MPH when I hit the wall with the right rear corner. 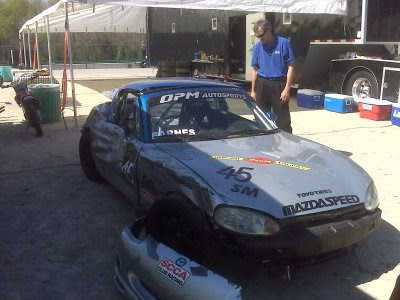 It would appear my Miata will live another day, too! Thanks to the awesome engineering by Mazda it would appear this thing still has straight frame rails and everything is "merely superficial." Not so superficial that it will buff out (as Tom at OPM said, "we didn't bring that much wax! "), but not so bad, ultimately. Especially for a triple digit hit. I can't complain too much, but I can take this moment to thank all the fine folks that helped me out this weekend, inlcuding Reid Allred, Glenn Austin from Traqmate Data Systems, OPM Autosports, and Rossini Race Engines. For whatever it's worth, it looks like I would have been 11th on the grid (and maybe higher, a few people were found illegal in impound after qualifying) on my time now, and could have probably improved to around sixth or seventh if I had some clean track and working brakes. Oh well, we live to race another day. Get your elbows off the table! Where will we find our music?